Two Los Angeles gangs have launched a sick contest betting on who will be the first to kill 100 people in 100 days. 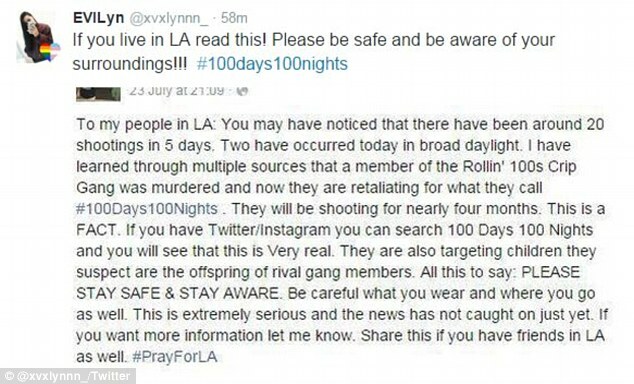 Under the hashtag #100Days100Nights Twitter and Instagram users are warning that scores of innocent people may be risking their lives should they venture out between the streets of Western and Normandie in L.A. The terrifying bet was allegedly made last week following the death of Rollin 100 gang member ‘KP’. The posts on Instagram and Twitter have been taken seriously by police and led LAPD officials to deploy more officers to the area, police sources told the Daily Beast. It is not clear if gangs plan on targeting rival members, but a spate of random shootings across L.A. over the last week suggest that the “game” is already in full swing and innocent men, women and children are being used to keep score. A rise in violent crimes occurred over the weekend as one man was shot dead and 12 were wounded after more than six shootings in the 77th Street district – which has some of the city’s most violent neighborhoods, the Los Angeles Times reported. On Thursday night, a woman and two young boys aged four and 11, were wounded after the gunman, who is still at large, approached their car and opened fire on the 2000 block of West 99th Street. Anthony Alonzo Cudger, 47, was shot and killed on Saturday after a suspect drove to his car and opened a round of fire at the intersection of 81st and Hoover streets before leaving the scene, according to the Daily Beast. Less than an hour following that shooting, a man in his 40s was shot while in his car at the intersection of 75th and Figueroa Streets – only seven blocks away. The man was able to drive to the hospital but the suspect is still at large. A man in his 20s was found by authorities shot in the stomach at Hyde Park Boulevard and Brynhurst Avenue and was rushed to the hospital. Less than four miles away and around half an hour later, one woman and two men were shot while walking down 47th Street and Budlong Avenue. They were all taken to hospital, where one is in critical condition. On Saturday night, police from LAPD’s 77th Division issued a tactical alert – spanning from Vernon Avenue to Manchester Boulevard and Crenshaw Boulevard to Figueroa and San Pedro streets – following the string of gang shootings that occurred over five hours, according to ABC7. In California, where strict firearms restrictions make it nearly impossible for most to carry a personal defense weapon, residents are left with two options. They either need to stay home and away from the public. Or, if confronted or shot, they can call the police who will arrive several minutes after the fact. We can think of no better justification to carry a personal firearm than what is happening in Los Angeles. Violence across America continues to increase at a rapid rate. And we have yet to even witness the worst-case scenarios that may follow a serious collapse of the financial and economic systems. In such a scenario violence will not just be centered in gang-ridden areas of the inner city. Rather, we’ll see violence spread to peaceful neighborhoods all over America.